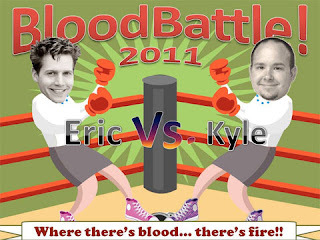 doug: Donors wanted: Join the BloodBattle 2011 July 28! On Thu, July 28, the Bloodmobile will be at the New Westminster Campus. To support one of our Douglas College Student Ambassadors (currently going through chemo), Eric Glanville, Manager of the Office for New Students, and Kyle Baillie, Director of the Centre for Campus Life, have a wager to see who can get more people out to donate blood. Check out the Facebook page for more info. You can read the full story here.